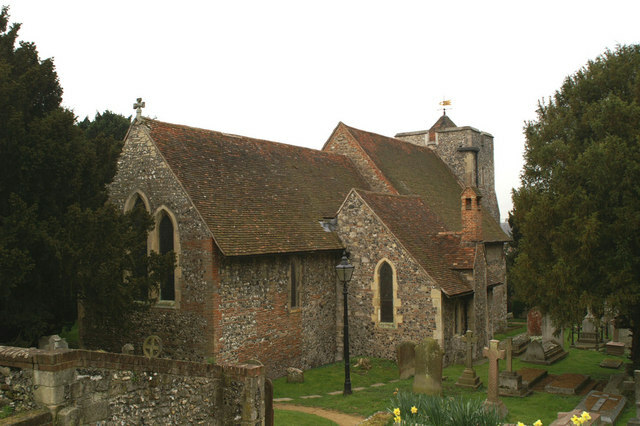 St Martin's Church, Canterbury is said to be the oldest church in the English speaking world still used for worship. Its history predates the arrival of St Augustine from Rome and was his first English church, so the first Roman Catholic church in England, Celtic Christians being here prior to this. It is a part of the listing for World Heritage Sites connected with Canterbury Cathedral and St Augustine's Abbey. The claim that it is the oldest church still in use, is based on it being the first church in England under the popes brand of Christianity, established by a mission directly sent from Rome. A feature of the catholic takeover of other brands was non recognition and destruction of their records, it would be difficult to determine which was in fact the oldest original Christian church. (See also Christianity in Britain which looks at how Christianity arrived in Britain and the early history, including the development of Celtic and Roman branches of the Christian faith and their amalgamation). Parts of the church are from a Roman building, and this was the first church there were records of on this site, although early Christians are known to have been in Canterbury when the Romans were here far earlier. We know the original part had been a roman building. The next recorded event was when Ethelbert, heir to the throne of Kent, married Frankish princess Bertha, daughter of the dead King of Paris, brought up near Tours. St Martin had been the Bishop of Tours two centuries earlier. Amongst the marriage condition, Bertha was to be allowed to continue to practice as a Christian, and she brought with her, Bishop Liudhard as her chaplain. Ethelbert gave her a Roman building next to the old Canterbury to Richmond road for her church, this is the western part of the chancel in the current church. The date was around the 580's, and as we can presume it had a roof and was in good repair, it may well have already been used for Christian worship at that time, and since the time of the Romans. Christians were known to have been in Canterbury at the time of the Roman's. It is thought that this part of the church was built as a Christian church originally in Roman times, although no records exist. In May 597, St Augustine arrived from Rome sent by pope Gregory with the mission of converting the population to their type of Christianity. He was accompanied by a Frankish interpreter and 40 companions landing on the Isle of Thanet. Augustine had not wanted to come and was consecrated as Abbot and Bishop for this mission. He was met by King Ethelbert, and given safe passage plus was encouraged to base their mission at Queen Berthas chapel. In this church they first began to meet, to chant the psalms, to pray, to say Mass, to preach, and to baptise, until when the king had been converted to the faith they received greater liberty to preach everywhere and to build or restore churches. This confirms that there were churches to restore already existent at this time. The church was extended at this time. The King was converted, the pope wrote that at Christmas 597, 10,000 Kentish people had been baptised. He then sent a second mission to reinforce, along with books, vestments, utensils, and relics. The Pope also sent Augustine a Pallium, which was both a mark of achievement or favour but also as only Archbishops and Popes could wear them it follows that Augustine had been rapidly promoted to Archbishop. The King had given Augustine a site for his household in the city and a former Roman building for his Church. Augustine died on the 26th May in a year between 604 and 609, and was buried initially outside St Augustine's Abbey, referred to at the time as the abbey church of St Peter and St Paul. He was later moved to a place within the abbey known as the Poticus of St Gregory. There was on the East side of the City a Church dedicated in honour of St. Martin; built of old while the Romans were still inhabiting Britain. It is mentioned in a Saxon charter of 867. It gave its name to two Suffragan "Bishops of St. Martin's" in 1032 and 1052. The Church was a peculiar (which means it is independent of the Archdeacon) and so remained exempt from the jurisdiction of the Archdeacon of Canterbury. Markings in the stonework show different styles, ages and modifications. On the left hand wall as you enter the porch is the cumbrous monument to Sir John Finch, the Speaker in the House of Commons in the reign of Charles I, who was held down in his chair by Hobbes and others, in order that the protest against the infraction of the Petition of Right might be passed. He is buried in the Church on the right hand side of the Altar. This monument was removed from the Sanctuary to its present position about 1900. The old booklet online shows a very interesting old stone font. It also gives a great deal of detail on different parts of the churches as well as details of damage it sustained in the Second World War. (See link below). St Martins Windmill - very nearby SEE OS map - now converted to a house with sails. Christianity in Britain, looks at how Christianity arrived in Britain and the early history, including the development of Celtic and Roman branches of the Christian faith and their amalgamation.